Welcome to day 11 of my #FrenchVillageBookworm advent calendar where today I am sharing a book that would make a perfect Christmas present for the special person in your life. 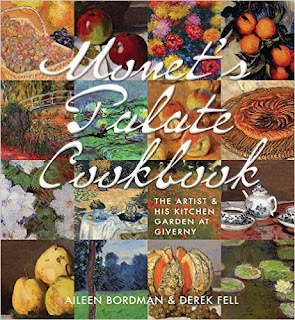 My review today is for Monet's Palate Cookbook: The Artist and His Kitchen at Giverny by Aileen Bordman with photographs by Derek Fell. This book is an absolute delight and covers so many of my passions I’m not sure what I was more excited about. There is France, food, gardening, photography, colour and art, all packed into a beautiful hardback book that looks, feels and smells divine. Aileen begins by setting the scene, explaining how important the kitchen garden at Giverny was to Monet. We all know about his garden, the water lilies and his art that was inspired by the beautiful retreat he created in Normandy, but I’ve now learned that he was also very passionate about growing and eating his own food, just like me. When his art took him away, his letters home always enquired about his kitchen garden and how it was coping without him. There is a detailed description of the fruits, vegetables and herbs that were grown as well as tips for setting up a small potager of your own, all illustrated with lovely photos by Derek Fell and featuring paintings from Monet. The second part of the book is a recipe section with a varied selection of appetizers, main courses, side dishes, desserts and cocktails, all inspired by the ingredients of a typical French potager that are clear and easy to follow. I was really in my element here, drooling over typically French and Norman dishes including Camembert Fritters with Apple and Raisin Chutney, Roast Pork with Cherry Sauce, French Green Beans with Walnut, Parsley and Orange Relish and Normandy French Apple Tart. There is even a cocktail called Impression Sunrise in the Garden, inspired Monet’s painting of the same name and containing honey, blood orange juice, mint leaves, crushed ice and sparkling water. I know that this book is going to get a lot of use in my kitchen. I have learned so much, I’ve got new ideas of what to plant in our potager next year and loads of new recipes to try, plus it has made me even more determined to make a visit to Giverny in the near future. Many thanks to Aileen for generously mailing me the hardback version of this book to review. Monet's Palate Cookbook: The Artist and His Kitchen at Giverny is available in hardback and ebook format, but I really do recommend treating yourself (or someone special as it is almost Christmas) to the hardback book that will look great on a coffee table or take pride of place in your kitchen.